Best is tough. Best is explosive. Best is fast. Although he is not currently part of the NFL, he more than deserves to be on this list. One thing can be said of Best: He goes out with a bang. 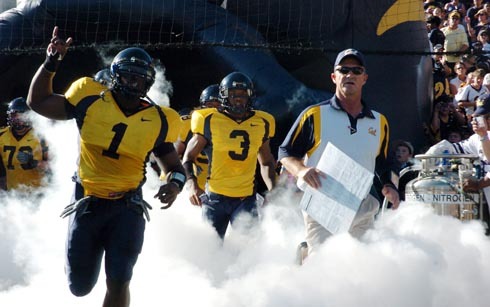 Those who have been following Cal football remember Best’s incredible Oregon State touchdown for the Bears in 2009, which also happened to be his last game at Cal. That touchdown gave him his second concussion in two weeks and led to his retirement from college football. 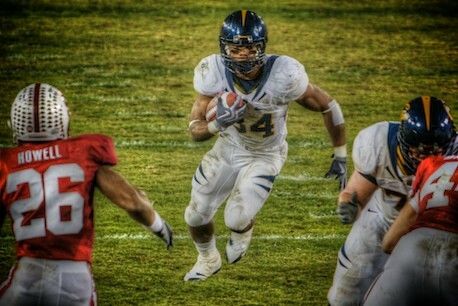 Look, we know no one likes the Patriots, but Shane Vereen is another running back out of Cal who deserves mention. With an impressive college total of 1,167 rushing yards, Vereen left Cal in three years and was drafted by the New England Patriots in 2011. There, he continued to play well, reaching a career best of an 83-yard reception. Currently, he has 308 rushing yards and four touchdowns. But these stats don’t fully explain why he’s on this hall of fame list. Remember two Sundays ago? Patriots vs. Jets, and the Pats chief running back Danny Woodhead is injured. It’s down to veteran Stevan Ridley and third-string nobody Shane Vereen. Vereen delivers the football to the endzone three times. Yes, Tom Brady deserves some credit for some accurate passing, but Vereen really showed the world what he can do. We don’t root for the Patriots any more than you do, but there are those magical moments when Vereen makes this world a better place and the Patriots head cheater is almost tolerable. Hmm, a ram is a fearsome mascot in theory. Upon seeing that sweater-clad goofball of a creature waddling amid the jogging CSU players, we revised that assumption. Immediately. Let’s just hope that Cal became overconfident after spotting the pudgy Colorado State mascot and that’s why the team played a slop of a match. If that’s not the attribution for today’s “victory,” we have some issues here. Anyway, here are our very profound thoughts on a “slightly scary besting of a thoroughly unmemorable opponent”. From now on “DeSean“ will be in the bold. He’s earned it, dammit. Sure, a little more receiving involvement would be nice. But, after yet another game-breaking play, bolding his name is the least the Clog can do. It’s like getting knighted … but lamer … a lot lamer. Sick interception, Moye. You aren’t bold status quite yet, but that was a spectacular play. So apparently it is possible to overthrow DeSean. It looked like Longshore had been practicing with a lead ball in pre game. Though there were moments of defensive, um, competence, the secondary was fairly bad. For a team with an annual “Oh man, please let us beat USC” quest, that could be a huge concern. Oh wait, their QB is John David Booty. We might be in the clear. The DeSean Jackson punt return was unreal. He’s a better PR man than Reggie Bush was in college. Can he do the kickoffs too? That could be cool. The obligatory “Berkeley is CRAZY” coverage is always galling. It’s not that we hate RunningWolf interviews or Oaks reporting in general (in fact, the war over the Oaks never ceases to enthrall us). We’re just sick of getting stereotyped as Flower Child U. Um, why couldn’t the media focus on all the Berkeley hippies, eccentrics and street preachers who weren’t living in trees? Part of the Berkeleotyping effort was the insane focus on Nate Longshore’s new look (obvious crack: Uh, you mean he looks like a great quarterback who won’t fold under pressure?). ABC just had to seize on Nate’s turning into Shaggy from Scooby Doo and talk about the QB’s Berkeleyification for centuries. Justin Forsett was great, but he’s no Marshawn Lynch. The lack of a big, griding back will hurt us eventually. But our defense will hurt us more. Jeez, they were awful. That awesome forced fumble was deceptive. Were there really 11 guys out there on Saturday? It felt like five at most. And all five were named Syd’Quan Thompson. Jahvid Best is too fast for description. We tried to come up with a way to talk about him but just ended up sounding football announcerish (That guy can really, really, run the ball!). If you haven’t already seen the ESPN the Magazine cover with DeSean Jackson on it, well, we just got to say it’s the best of the three regional covers. While Arkansas’s Darren McFadden and Brian Brohm of Louisville are just standing there, looking like they’re hot stuff, D-Jax took to the air, flying to catch a football. Haven’t seen it yet? Click on that video up there, which was taken during the photo shoot for ESPN the Mag. At the very end, you see the Golden Blur’s cover, alongside the other two really boring ones. It’s really interesting to see that ESPN went away from the whole USC bias and went with D-Jax for the west coast cover. We guess John David Booty(call) wasn’t flashy enough. And maybe that was a good thing, because then we’d have three covers that look exactly the same. And it’s interesting how D-Jax keeps referencing Tupac’s “All Eyez On Me” album, especially in the video and in SI.com’s most recent feature on the speedy wide-out. But hey, if Cal beats Tennessee on Sept. 1 and D-Jax has one of those amazing punt returns or makes an amazing grab, then all eyes better be on him (and the Bears). ESPN’s SportsNation is a conglomeration of chat rooms, user opinions and of course the almighty user poll. SportsNation has a different poll everyday—sometimes every hour. So are we surprised that SportsNation has a poll for the public’s pick for the Heisman Trophy? SportsNation picked out 13 different Heisman candidates. Of course, the usual suspects are there—John David Booty(call) from USC, Darren McFadden from Arkansas, Steve Slaton from West Virginia and the Golden Blur, DeSean Jackson. And then there are some unusual honorees, like Kentucky’s Andre’ Woodson (really?! Kentucky?!). So what we’re asking you to do is simple and go over to that ESPN site and vote. But we don’t know what kind of response we’ll get from you Clog readers. The last time we asked you to vote for something, Cal ended up losing. And after our votes, D-Jax is currently 12th out of the 13. Who’s the guy that’s in last place? Woodson, of course. But D-Jax doesn’t belong in 12th. He at least needs to be in the top 10, which in this poll, isn’t saying much. Is D-Jax Really a Heisman Candidate? If the Golden Blur, DeSean Jackson, can do what he did in that video up there a few more times next season, we’re sure he’ll be able to at least get some votes for that bronze trophy. We’ve already oogled all of the Cal PR machine’s fancy new website for D-Jax. But we ask, can he really win the Heisman Trophy?Quite possibly. Rich Cirminiello over at FoxSports.com ranked D-Jax No. 15 in his list of Heisman candidates, ahead of guys like Tim Tebow of Florida. And the college football blogger over at the Sporting News thinks that Jackson is the Pac-10’s third-best player, behind John David Booty(call) and Rey Maualaga of USC. But history is against D-Jax. The last time a receiver won the Heisman Trophy was when Desmond Howard did it in 1991 for Michigan. But the thing that Jackson has in common with Howard and another receiver who won the trophy, Tim Brown in 1987, is that all three were/are amazing return men. (Howard’s Wolverines also won the Big Ten that year, which may be a prerequisite for D-Jax. Cal’s got to do better than 10-3). But as Cirminiello points out, Jackson’s return ability is tied to whether or not he’ll get the ball. Even when they moonlight on special teams, receivers win the Heisman about once every generation. Once opponents wise up and completely ban punting the ball to Jackson, he’ll lose the one hook that makes him so unique. But the Heisman Hype for D-Jax started even before the end of last season, as AOL sports notes. Unlike most receivers, Jackson has a halfway decent chance to win the award because he is a kick returner. Jackson will have to overcome Cal’s limited Heisman credentials, but chances are he’ll be the best offensive player on one of the nation’s top teams next year which should take him far. Speaking of that, how can D-Jax win the Heisman? Well, the Bears have to get off to a good start. 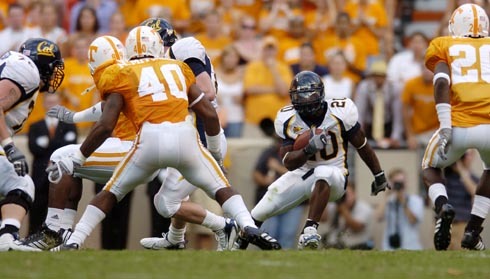 What derailed Marshawn Lynch’s Heisman bid was the beat down Cal received at Tennessee. Sure Lynch had great stats, but once every writer wrote off the Bears as just another pesky top 20 team instead of a top 10 team, Lynch’s Heisman campaign pretty much died. So a lot of things ride on that Sept. 1 showdown with the Vols: D-Jax’s Heisman chances and Cal’s reputation as a major player in college football. But we’re sure if he can showcase his 4.29 40 speed like he did in that video up there, then he’ll get consideration for the Heisman and the Bears won’t be an afterthought. When the Clog heard about the university’s new “DeSean Jackson for the Heisman” website, we got kind of giddy. We miss football. A lot. Yes, life without watching large people hurt each other on Saturdays has been that rough for us. We yearn for it so much that we spent our valuable time critiquing this ridiculous PR vehicle. Who cares that the sole purpose of the site is to boost a fellow student’s chances of getting a meaningless award five months from now? Like an impoverished heroin addict reduced to black tar, we needed to pour over this thing. Fortunately, “The 1 to Watch” is enjoyable on multiple levels. First, there are cool clips of Jackson. Second, there are inane tidbits about him that we’ll never, ever need to know (unless we’re of the De Niro from “The Fan” mindset). And third, well, we don’t know what the third is. But surely there’s a good reason the Clog reviewed this. Godzilla Jackson towers over the Bay Bridge. He’s in a cat-like pose. Only he looks slightly confused (like the Clog’s cat, when we cruelly spray it with our squirtgun). About three million lighting bolts rain from an ominous, blackened sky. 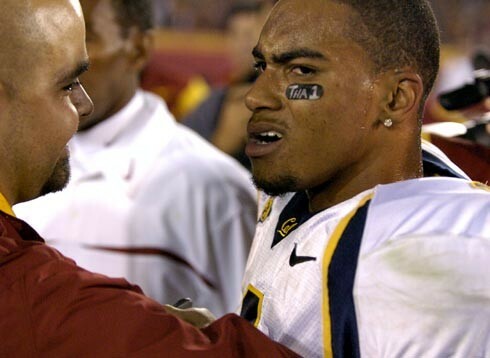 The message to Cal football fans is clear: A giant, menacing, bewildered D-Jax will bring the apocalypse to us all. And you will love him for it. Somewhere, Pete Carroll is soiling his designer khakis. But oh, there is the flash animation intro. Animation so flashy, that calbears.com even bragged about it in their promotional article. Well, let us be the first website critiquers to tell you, this is damn good flash animation. It changed our lives. We now know who the one to watch is. The interviews with Jackson are nuanced, insightful and profound. Jackson’s speech on Putin’s rekindling of the Cold War paradigm was truly enlightening. Just kidding, the interviews are just kind of bland and lame. Though we do feel happier knowing DeSean has a pet pit bull named “Blue.” He refers to the dog as “my little Blueskie.” Hmm, would that mean that Michael Vick refers to his pit bulls as “my little, motionless, Redskies”? Glad that’s finally out in the open for us all to ponder. Unfortunately, we’re kidding about that one. DeSean actually said something about working hard, but we aborted the clip in favor of watching compilations of his awesome highlights. Good decision. We suggest you do the same when fiendin’ for the fooseball.